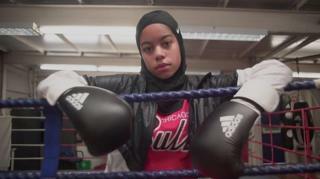 Thirteen-year-old Aida is one of only a few hijab-wearing boxers in the UK and she's become a role model for other girls. Aida's dad loves boxing and got her into it when she was very little. Since then she's loved the sport. But she's faced hurdles along the way because she wears a hijab. CBBC's My Life has been following her journey to the ring as she faces gruelling training, a strict diet and of course, injuries. Will her three years of hard work pay off? My Life: A Fighting Chance is on the BBC iPlayer. What's the difference between a hijab, niqab and burka?